One of the strengths of the Caleva Mixer Torque Rheometer (MTR-3) is that it can be used to verify the properties of wet powder masses of samples taken during production in large scale mixer/granulator systems. It can be used simply as a QC tool on a regular basis or specifically as an aid to problem solving. Small samples can be taken directly from production and within two minutes a measured consistency value can be obtained. This is generally assumed to be representative of the whole batch although in the example below, it can be seen that this is not always the case. Have you checked the consistency of your product in your granulator? 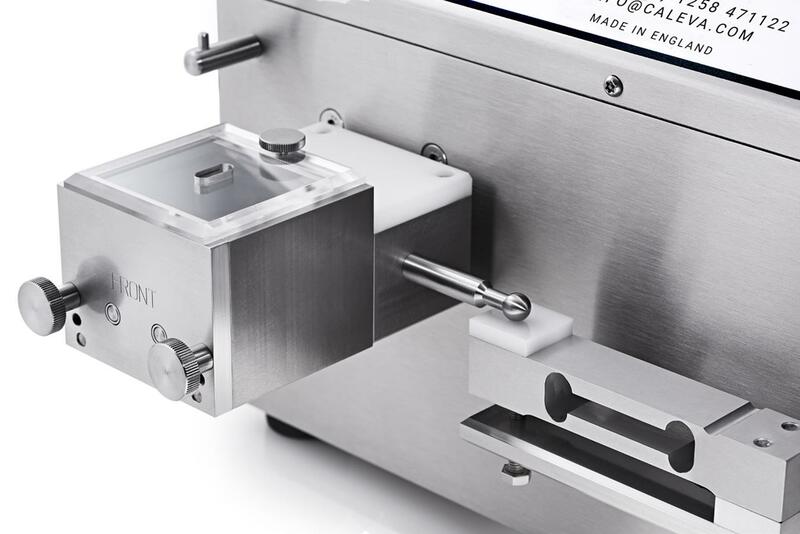 For this purpose, the MTR-3 is used in its ‘consistency’ mode and a numerical measure of product consistency is achieved. The benefit of using the instrument in this manner can be demonstrated in the following example. Caleva was approached by a pharmaceutical company who were manufacturing pellets by extrusion and spheronization and were experiencing problems with reduced useable yields of pellets. This resulted in significant cost implications and needed to be addressed as a matter of urgency. The pellet size range of commercial product will be prescribed by regulatory documentation – pellets which are either too small or too large and fall outside this permitted range will need to be discarded. This wastage of “useable yield” can result in significant cost implications. Only pellets which fall within this permitted size distribution are allowable. It is therefore important that the production process is optimised to achieve maximum useable yield. 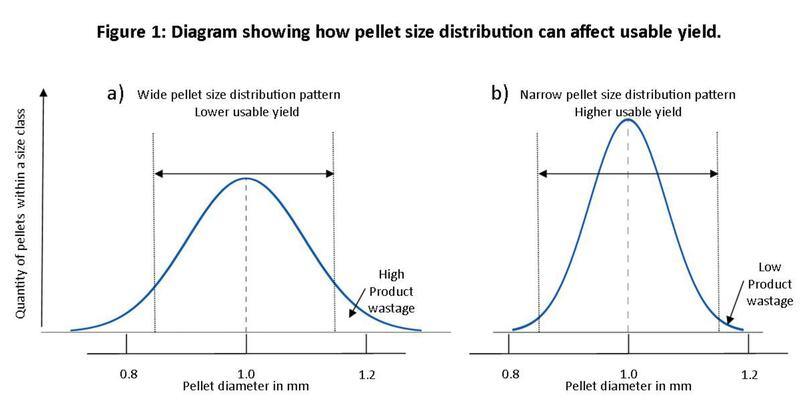 subsequent high product wastage and the other (b) showing a more optimal narrow pellet size distribution pattern with significantly less product wastage. In this real instance the “useable yield” in an extrusion and spheronization process had deteriorated from approximately 99% to below 93%. In order to identify the source of the losses, several issues were looked at in parallel including consideration of the raw materials, granulator adjustments, tolerances etc. One of the parameters considered was the homogeneity of the product produced by the granulator. Using the MTR it was possible to look at this homogeneity of the batches being produced before the product was moved to the extruder for the next production phase. Figure 2 is a graphic representation of how the MTR-3 was used, in its consistency mode. 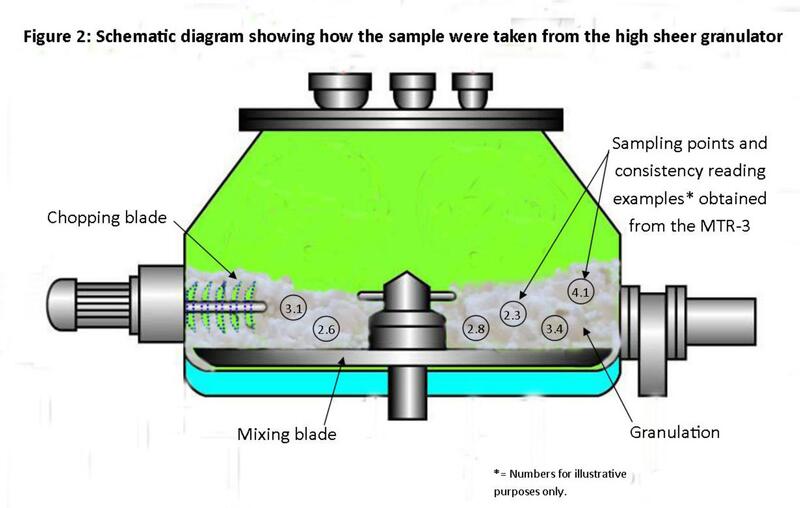 Small samples from different areas of the granulator were taken for analysis and it was found that the granulation was not homogenous in its consistency. It was found that the granulator was a major source of the problem (reduction in “useable yield”) and this allowed remedial action to be taken. Without the MTR-3, it would have been practically impossible to identify the source of the problem. Not only invaluable in determining the optimum binder ratio and optimum mixing time, the Caleva Mixer Torque Rheometer (MTR-3) is also of significant value as a QC tool when used in in its ‘consistency’ mode to verify the properties of wet powder masses produced in large scale mixer / granulator systems during production. 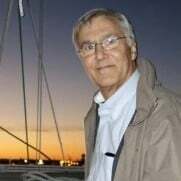 It can also prove invaluable in problem solving when issues occur.